The actions of animal protection activists have sent reverberations throughout Australia’s livestock industries in recent times. Revelations of animal cruelty in local processing and the live export trade have led to the forced closure of abattoirs, the filing of criminal charges, trade suspensions, and new regulation. Some think market forces will be enough to bring about change, but I would argue that productivity and animal welfare are not always compatible. In his opinion piece, “Why capitalism raises an animal’s spirits” published in the Australian recently, journalist Nick Cater takes aim at the “animal vigilantes” who took video footage inside an intensive pig farm near Young, NSW. An eight minute clip depicting row after row of squealing pigs confined to small concrete stalls was later posted on Youtube. 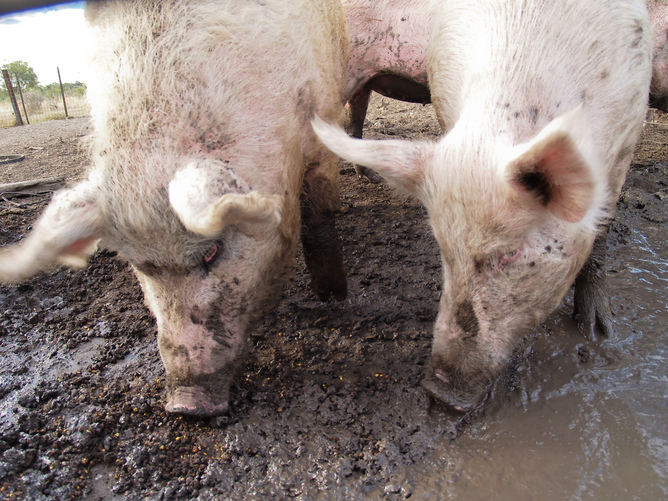 Cater argues market forces alone can prevent animal suffering. According to Cater this is because a producer has an economic incentive to protect animal welfare – “a happy pig equals profits”. This argument is commonly heard from representatives of the livestock industries and repeated by politicians. It is for this reason it should not go unchallenged. Modern animal welfare science has gone beyond measuring welfare solely by reference to physical attributes and mortality rates. Cater’s claim that in “the absence of reliable porcine attitude surveys, we can only go by the empirical evidence of health and death rates”, underscores his ignorance. Physiological functioning, brain state, behaviour, physical condition, performance and even an animal’s feelings are now all recognised as key factors in assessing an animal’s welfare. It is possible to have a physically healthy productive animal that is in a poor state of welfare due to, for instance, psychological stress. If this is so, there is little economic incentive for a farmer to provide improved welfare, especially if doing so increases costs. Indeed, the economic literature shows animal welfare and productivity are in conflict. Under an economic model, productivity is prioritised and animal suffering is treated as a market “externality”. Market signals will generally cause welfare standards to fall below community expectations. Examples are not hard to find. Battery cages and sow stalls are known to have negative impacts on welfare yet they are designed to achieve productivity gains. Another obvious example can be found in the use of routine surgical procedures such as debeaking, tail-docking, dehorning, mulesing, castration and even the spaying of cattle. These procedures are performed without the administration of pain relief to keep costs down. Welfare protection and productivity can coexist in well-managed, free-range farming systems, but as the size and intensity of production increases, welfare begins to decline. No doubt Cater would dismiss this as a preoccupation of urban latte sippers, devoid of any experience with “the gritty reality of farming”. But it is precisely this dismissive mentality that is now causing Australia’s livestock industries serious headaches. “Values-based consumerism” is spreading throughout the Western world and may expand with the growing middle classes of Brazil, India, Russia and China. Livestock industries must strive to get ahead of these trends, not to fight them. Calls for US-styled “ag gag” laws in Australia to criminalise unauthorised filming and photographs in agricultural facilities are nonsensical and counterproductive. Such laws have been described by leading animal welfare scientist and meat industry consultant Temple Grandin as the “Stupidest thing that ag ever did.” By restricting the rights of whistleblowers, activists, and journalists to expose illegal and sometimes legal husbandry practises, they increase negative publicity and only fuel public curiosity over what happens to animals on factory farms. Producers who are in touch with their customers will internalise the costs of higher welfare standards and convey this product feature to consumers. By rejecting the archaic conceptions of animal welfare espoused by Cater, they will be well placed to capitalise on values-based consumer demands in the coming years. It is only when animal industries adopt this business model that there can ever be any truth to the proposition: “capitalism raises an animal’s spirits”. Jed Goodfellow receives funding from a Macquarie University Research Excellence Scholarship. He works for RSPCA Australia on a part-time basis.